This morning (local time in California) there was an earthquake in Papua New Guinea with, unfortunately, a high likelihood of having a good number of casualties. I was working on a project, so could not immediately begin work on this report. 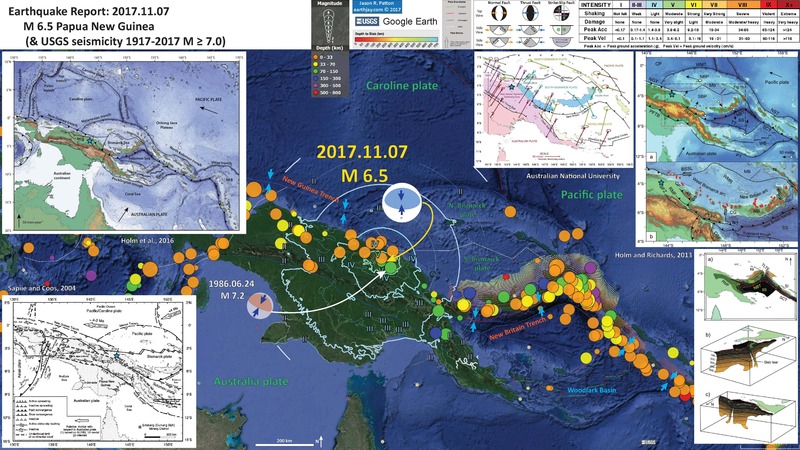 This M 7.5 earthquake (USGS website) occurred along the Papua Fold and Thrust Belt (PFTB), a (mostly) south vergent sequence of imbricate thrust faults and associated fold (anticlines). The history of this PFTB appears to be related to the collision of the Australia plate with the Caroline and Pacific plates, the delamination of the downgoing oceanic crust, and then associated magmatic effects (from decompression melting where the overriding slab (crust) was exposed to the mantle following the delamination). More about this can be found in Cloos et al. (2005). The USGS prepared a fault slip model that shows this earthquake may have ruptured a north vergent (south dipping) thrust fault. There was a M 6.5 earthquake north of today’s M 7.5 earthquake in November 2017. These earthquakes are along different fault systems and likely are too distant to be related. On 2018.02.26 I prepared an updated report here. I plot the USGS fault plane solutions (moment tensors in blue and focal mechanisms in orange) for the M 7.5 earthquake, in addition to some relevant historic earthquakes. There was a M 6.6 earthquake to the southeast along the PFTB in 2000 and I include the moment tensor for this earthquake. In the lower right corner is a great figure showing the generalized plate tectonic boundaries in this region of the equatorial Pacific Ocean (Holm et al., 2016). I place a blue star in the general location of the M 6.5 earthquake (also plotted in other inset figures). 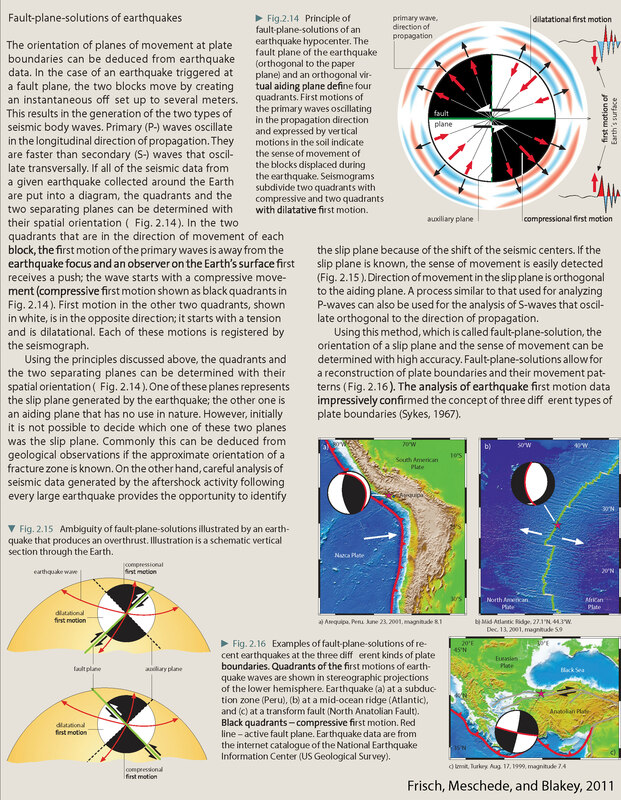 This map shows the major plate boundary faults. Active subduction zones have shaded triangle fault symbols, while inactive subduction zones have un-shaded triangle fault line symbols. In the lower left corner is a map showing the fault systems in the region (Cloos et al., 2005). The legend allows us to distinguish between active and inactive fault systems. In the upper right corner is a figure from Baldwin et al. (2012). This figure shows a series of cross sections along this convergent plate boundary from the Solomon Islands in the east to Papua New Guinea in the west. Cross section ‘D’ is the most representative for the earthquakes today. I present the map and this figure again below, with their original captions. In the upper left corner is cross section D-D’ that shows the PFTB. I placed the blue star along a north vergent fault that may be associated with today’s M 7.5. The faults are actually quite complex, so this schematic illustration may not be a perfect represetation of the fautls here. In the center left is a plot showing the larger aftershocks (large enough to show up in USGS database, a global catalog). The rupture length of the fault that ruptured today may be ~160 km. Considering empirical relations developed by Wells and Coppersmith (1994), a 160 km fault length would generate a M 7.6-7.7 earthquake (close to M 7.5, given the empirical relations and the uncertainty with those relations). The same map without historic seismicity. Here is the interpretive poster from last November (this is the report). Here is the Holm et al. (2016) figure. 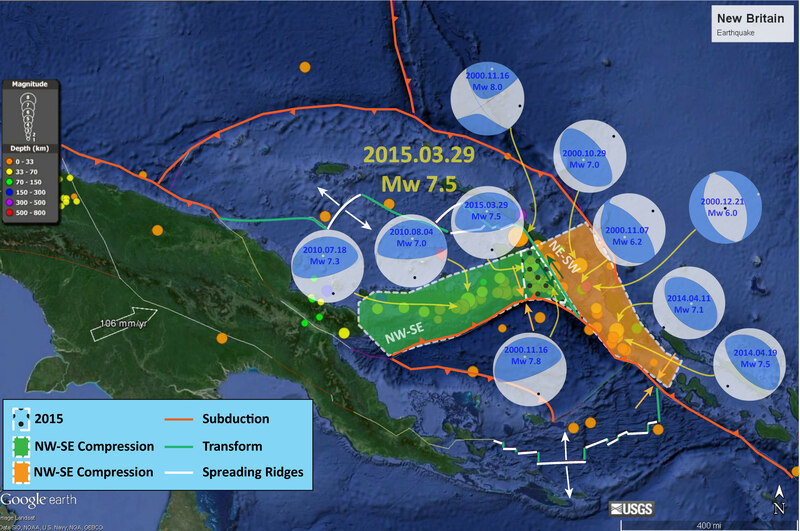 Koulali et al (2015) use GPS data to resolve the kinematics of the central-eastern Papua New Guinea region. The first figure below is a map that shows the GPS velocities in this region There are two cross section profiles labled on the map (the M 7.5 earthquake happened to the east of A-A’). Note the complicated and detaile dfault mapping (the balck lines). The convergence is generally perpendicular to the PFTB in the east and more oblique to the PFTB on the western portion of this map. The GPS velocity field and 95 per cent confidence interval ellipses with respect to the Australian Plate. Red and blue vectors are the new calculated field and black vectors are from Wallace et al. (2004). The dashed rectangle shows the area of Fig. 3. The blue dashed lines correspond to the location of profiles shown in Fig. 4. Note that the velocity scales for the red and blue vectors are different (see the lower right corner for scales). The black velocities are plotted at the same scale as the red vectors. Here are the two profiles. The red and blue lines plot vertical land motion (VLM) rates in mm/yr and show strain accumulates across the region. Today’s earthquake happened in the region labeled ‘Highland FTB.’ The plot shows that ~5 mm/yr of strain accumulates in this fault system. Profiles A–A& and B–B& from Fig. 2 showing model fit to GPS observations. Red symbols and lines are the GPS observed and modelled velocities, respectively, for the profile-normal component. Blue symbols and lines correspond to the profile-parallel component. The green and pink lines corresponds to the model using the Ramu-Markham fault geometry from Wallace et al. (2004), south of Lae. Grey profiles show the projected topography. The seismicity is from the ISC catalogue for events > Mw 3.5 (1960–2011). Here is a comparison of the proposed fault length shown on the poster with fault scaling relations from Wells and Coppersmith (1994). The upper panel is figure 9 and the lower panel is figure 17. I include figure captions for these figures below. Presuming a fault length of 160 km, the magnitude would be between 7.5 and 8. Figure 9. 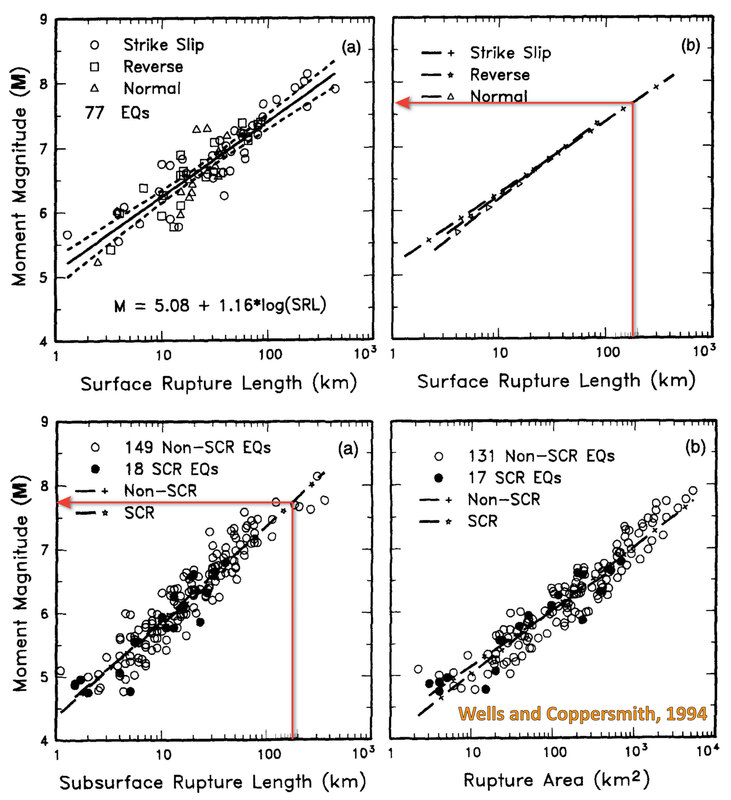 (a) Regression of surface rupture length on magnitude (M). Regression line shown for all-slip-type relationship. Short dashed line indicates 95% confidence interval. (b) Regression lines for strike-slip, reverse, and normal-slip relationships. See Table 2 for regression coefficients. Length of regression lines shows the range of data for each relationship. Figure 17. Regression lines for stable continental region (SCR) earthquakes and non-SCR continental earthquakes. (a) Regression of surface rupture length on magnitude (M). (b) Regression of rupture area on magnitude (M). Here is the USGS Pager Alert. More can be found about the PAGER alerts here. PAGER provides shaking and loss estimates following significant earthquakes anywhere in the world. These estimates are generally available within 30 minutes and are updated as more information becomes available. 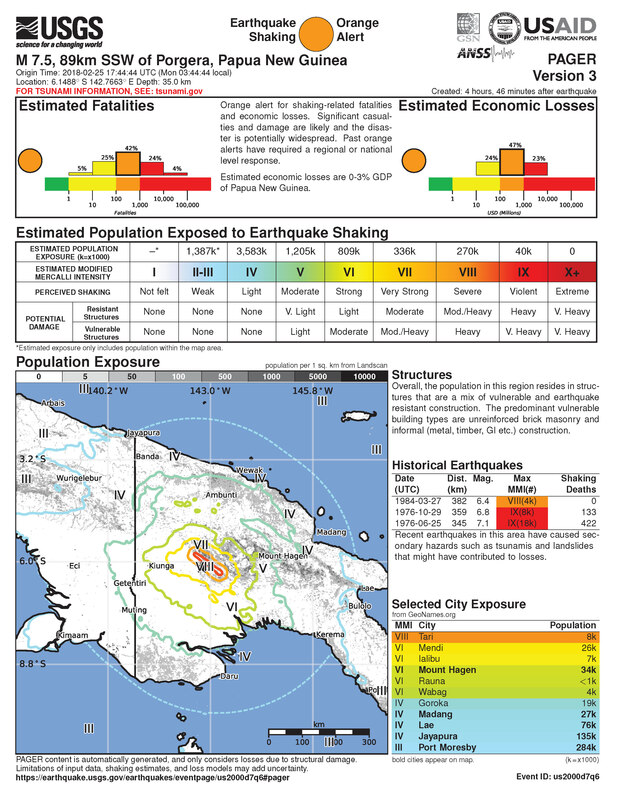 Rapid estimates include the number of people and names of cities exposed to each shaking intensity level as well as the likely ranges of fatalities and economic losses. PAGER does not consider secondary effects such as landslides, liquefaction, and tsunami in loss estimates at this time. This shows that there is a 42% chance that there will be between 100 and 1,000 casualties. We can only hope that there are fewer (which is possible). Earlier, in other earthquake reports, I have discussed seismicity from 2000-2015 here. The seismicity on the west of this region appears aligned with north-south shortening along the New Britain trench, while seismicity on the east of this region appears aligned with more east-west shortening. Here is a map that I put together where I show these two tectonic domains with the seismicity from this time period (today’s earthquakes are not plotted on this map, but one may see where they might plot). This map shows plate velocities and euler poles for different blocks. I include the figure caption below as a blockquote. The PFTB is shown as a kelly-green band of color. This figure incorporates cross sections and map views of various parts of the regional tectonics (Baldwin et al., 2012). These deep earthquakes are nearest the cross section D (though are much deeper than these shallow cross sections). I include the figure caption below as a blockquote. UPDATE (23:00 pacific time): This is one of the ground motion visualizations from IRIS. The red and blue colors represent the upward or downward motion recorded on seismometers. Note the background motions along the coast of WA, OR, and CA have high amplitudes (darker red and darker blue). This is probably due to the storm that is hitting the region (the wind blows trees, buildings, etc. and the waves pound the earth, both of which are recorded on seismometers). This is the first time that I noticed this phenomena on one of these visualizations. There are probably many other examples. Another cool thing is that about half way through the animation, the seismic waves that were traveling west from the earthquake, travel around the globe, and then are seen here, traveling from teh east coast to the west coast. This is common to most all of these visualizations. Baldwin, S.L., Monteleone, B.D., Webb, L.E., Fitzgerald, P.G., Grove, M., and Hill, E.J., 2004. Pliocene eclogite exhumation at plate tectonic rates in eastern Papua New Guinea in Nature, v. 431, p/ 263-267, doi:10.1038/nature02846. Baldwin, S.L., Fitzgerald, P.G., and Webb, L.E., 2012. Tectonics of the New Guinea Region, Annu. Rev. Earth Planet. Sci., v. 40, pp. 495-520. 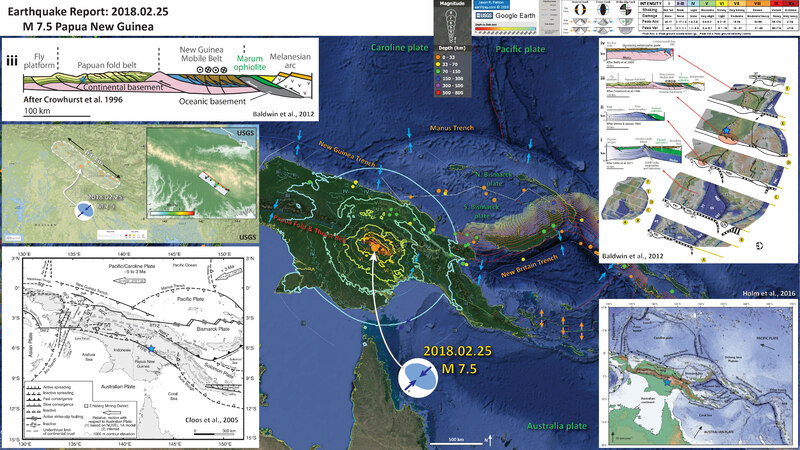 Cloos, M., Sapiie, B., Quarles van Ufford, A., Weiland, R.J., Warren, P.Q., and McMahon, T.P., 2005, Collisional delamination in New Guinea: The geotectonics of subducting slab breakoff: Geological Society of America Special Paper 400, 51 p., doi: 10.1130/2005.2400. Holm, R.J., Rosenbaum, G., Richards, S.W., 2016. 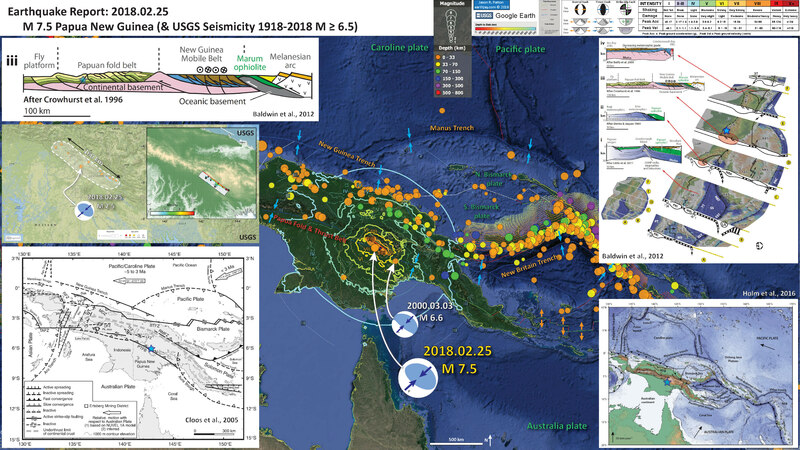 Post 8 Ma reconstruction of Papua New Guinea and Solomon Islands: Microplate tectonics in a convergent plate boundary setting in Eartth Science Reviews, v. 156, p. 66-81.